Gautam Pawar, a farmer with a wiry build, hailing from Maharashtra, was mobbed by news channels, jostling for his “bite” after he had shared the stage with PM Narendra Modi at the Fertiliser Factory Ground here on Sunday. The occasion was the launch of arguably the world’s largest farm sector scheme, titled the Pradhan Mantri Kisan Samman Nidhi Yojana (PM-Kisan). Modi handed over Kisan Credit Cards to a few farmers, including Pawar. The yojana is estimated to cost the exchequer Rs 75,000 crore annually. It will benefit more than 120 million small and marginal farmers in India, including 21.4 million in Uttar Pradesh (UP), the biggest beneficiary among the states of the country. With the farmer outreach through the launch of the scheme, the BJP laid down its template for the Lok Sabha polls, with the development agenda of 2014 having been replaced with the farm narrative. This comes at a time when the Congress has been insisting on farm loan waiver, especially after the party tasted success in the recent Assembly polls in the Hindi heartland states of Rajasthan, Madhya Pradesh, and Chhattisgarh. Modi in his speech was high on symbolism. He wore a light green kurta along with a saffron-hued waistcoat, subtly signifying the balance between the BJP’s twin agendas of agriculture and Hindutva. The high turnout on the concluding day of the BJP Kisan Morcha’s two-day national convention was aimed at blunting the Opposition tirade on the purported farm distress under the Modi dispensation. Modi spiced his modulated speech with descriptions of farm-related achievements of his government. “You know when the PM-Kisan scheme was announced in Parliament, the faces of Opposition leaders became grim,” he said, alleging Opposition leaders had launched a misinformation campaign or just spreading lies. Modi blamed the Congress for “making hollow promises to farmers and keeping agriculturists at the mercy of the rulers”. “Our government is making efforts to provide farmers all such resources that would help double their income by 2022,” Modi said in the presence of UP CM Yogi Adityanath, BJP National Kisan Morcha President Virendra Singh Mast, Union Agriculture Minister Radha Mohan Singh, among others. Modi, with a click of the button, transferred almost Rs 2,021 crore to the bank accounts of more than 10 million beneficiaries in the first instalment under PM-Kisan, which is the flagship scheme of the Modi government and provides a minimum income guarantee of Rs 6,000 a year to small and marginal farmers. “In 2008, farm loans amounted to Rs 6 trillion, according to the official data of banks. However, the Congress government waived loans worth only Rs 52,000 crore of 20-30 million farmers, although the farmer count was 120-130 million,” Modi said, asking if such a party could be trusted by the people. He said the BJP could have adopted the “easier” path of farm loan waiver, but the government chose the cash dole scheme since it weeded out middlemen from the process and provided ready cash to beneficiaries during sowing time and protected them from moneylenders. Modi said the remaining beneficiaries would receive the money in their bank accounts in the coming weeks, even as he warned farmers to remain vigilant about the alleged rumour mills of Opposition parties.Meanwhile, Mast told Business Standard almost 5,000 farmers’ delegates had arrived for the two-day convention in Gorakhpur, inaugurated by BJP President Amit Shah on Saturday. “Now our Morcha members would fan out in the villages to interact with farmers and expose the lies of Opposition parties. This was the first national-level flagship scheme launched by Modi from UP after PM Awas Yojana and Ujjwala Yojana. Besides, the PM laid the foundation of development projects of more than Rs 10,000 crore on the occasion, including the proposed gas pipeline from Kandla to Gorakhpur, estimated to cost nearly Rs 9,000 crore. 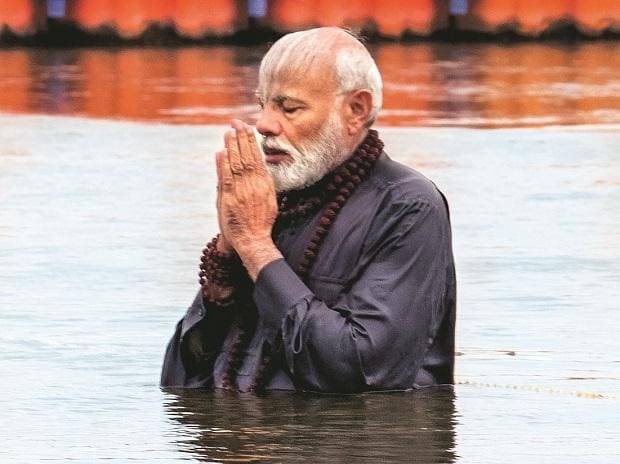 Later, Modi left for Prayagraj for a dip at the Sangam (pictured) during the Kumbh. PM Narendra Modi on Sunday suspended his monthly Mann Ki Baat broadcast for March and April, and said he will be back with the programme on the last Sunday of May, by when results of the Lok Sabha elections are expected to be declared.